Fun kid party games for your child’s birthday party! Make two teams of 6 players each and form the teams in lines. Give teaspoons to the first two players. Put 2 chairs 8 meters away from each team and place an apple on each chair. Players have to run and pick the apple without using their hands. Then they have to pass the apple to the second player’s spoon. The one who passes the apple through all the players wins the game. Beating the pinata is a great game idea for every kid birthday party. Kids have fun trying to break open the pinata to get the party favors and candy found inside! Choose one of our pinatas like the ones found below. 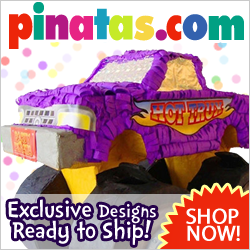 We have pinatas on the most popular themes and characters. Play the pinata party game or convert a common pinata into a pullstring one. A pull pinata with colorful ribbons is just as fun as the common pinata party game. Each team is given many-colored balloons, lace and string. At the leader’s command the team must make a many-colored garland of balloons. So they must blow up the balloons, tie them with the string and make a garland. Who’ll make it better and faster? Blindfold all players except one. They stand in a circle around the stake. The distance between the stake and “the blinds” is around 30-50 steps. Turn the blinds round and round for three seconds and face them to the stake.”The sighted” player begins to count the number of steps and all “the blinds” walk toward the stake. When “the sighted” finishes counting all the players stop and move away their fillets. The players are usually surprised at seeing themselves having gone to the wrong direction. The one who walked closest to the stake wins the kid party game . Your kids will sure have fun with these kid party games. Remember to give prizes to the winners! You can choose some from our party posters and party favors. Party toys and posters on your kid’s birthday party theme make great gifts!